For the last several months, I’ve been volunteering at The Deaf Unit in Cairo. Last Fall I went on an embassy-sponsored tour of the school, having no idea what it was. During the tour I was so taken with the energy of the staff and these phenomenal children, that when the Director said she was looking for some office help, I quickly volunteered. Aside from some upsets with holidays and my travels, I’ve been going every Wednesday. They even arranged for the chef’s husband, Ata, to be my weekly driver. So instead of paying some random cab, I pay Ata. And we smile at each other, and I attempt to communicate with my frustratingly-slow Arabic as Ata’s English extends to “good” and “yes.” But we get by. I wrote the following article on the Deaf Unit for one of the monthly expat magazines in Cairo and accompanied it with just a few of the 150 photos I took (I could have taken more, believe me). When Clair Malik speaks about the hundreds of kids she calls her children, her eyes shine with pride and her hands fly even faster as she subconsciously signs as she speaks, regardless of my inability to follow what her hands are “saying.” And it’s clear that the adoration is mutual as I follow her out to the playground during the break time and she’s instantly surrounded by many of the 70 children who attend school at the Deaf Unit in Cairo. She addresses them all, and takes the time to admire John’s sketch pad which he’s brought to school to show her. She tells me with a smile that he says he doesn’t like carpentry, he prefers to draw. So while she encourages his art, she tells him he still has to go to carpentry class. I take this opportunity in the playground to step back and snap some photos. However, as soon as the camera is out, the divas of the Deaf Unit converge on me, lead by 6-year-old Nada. Camera-shy they are not, so I do my best to make sure I get photos of everyone, especially those who tug on my sweater. Even the few who are tentative at first, find themselves beaming after seeing their picture in playback. And once the divas are let loose it’s hard to rein them in. I eventually have to stop letting everyone see their photos, just so I can continue to take some. Despite our seemingly cavernous gaps in communication, I don’t know any Arabic sign language and my verbal Arabic is burgeoning at best, we are all able to understand each other. The toothy grins and little hands waving the universal sign for “I love you” pretty much say it all. As break time ends and we all head back into the classrooms, I’m able to catch a few non-interrupted moments with Clair. Following three years of study in Lebanon to become a sign language teacher, she returned to Cairo with a definite sense of what God’s purpose for her was. So, in 1982, with Father Andeweg and the support of the Anglican Diocese of Egypt, she opened the doors of the Deaf Unit and as its Director has been the driving force for the last 26 years. She started with just four students and a teacher, and today has 70 students, from the ages of five through sixteen, with 54 of them who board at the school during the week because their families live in Upper Egypt. 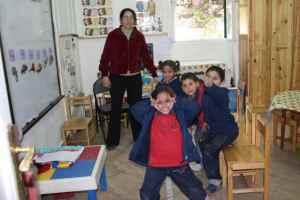 She relies now on seven teachers, 30 household and administrative staff, 32 employees in the adjacent Vocational Training Center and Deacon Faraj, who arrived in 2007 and has been instrumental in the growth of the Deaf Church and the Deaf Club. We take a break from our one-on-one and Clair takes me on a tour of the eight classrooms, covering grades KG1, KG2 through six. Peeking in on KG1, I see four six-year-olds sitting in their chairs attentively listening to their teacher, Ms. Hanan. This lasts only a few seconds before dear Nada spots us again and with a squeal of delight charges us at the door. Suddenly there are four gleeful, screaming children leaping about and posing with “I love you”s waving all around. We apologize for the interruption, and Ms. Hanan attempts to regain control, but I can see Nada keeping an eye on the doorway, just in case. We catch the rest of the classrooms in the midst of studying history, Arabic, English, geography, science, Arabic sign language and math. 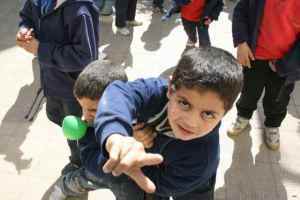 They also teach Arabic lip-reading and voice therapy, relying on trained speech therapists working with the kids one-on-one with amazing results. They offer pre-vocational training in sewing, carpentry and metalworking and they have a computer room that Clair admits is in desperate need of new equipment. Despite primary funding coming from the church, she’s greatly appreciative for the financial and substantive donations from the community that enhance the children’s living and educational environments, such as computers, sports equipment, books and DVDs for the library, and washing machines and driers (with laundry for 54 kids every week, these machines are essential). We stop in to see Gorg teaching Ra’id and Michael some of the basic names and signs for carpentry tools in their pre-vocational class. Gorg is also hearing-impaired, and in addition to the pre-vocational classes, he teaches and works at the Vocational Training Center behind the school. The VTC trains and employs over 30 hearing-impaired adults in sewing and appliqué, carpentry and metalworking, affording them the chance to become an expert in their trade and further improve their quality of life by promoting social and financial independence. In addition to all their custom-made orders, the professional crafts they produce are sold in shops and bazaars throughout Egypt. One recent milestone in January was erecting the foundation stone for a new state-of-the-art VTC complex out in Sixth October. The goal is to increase their outreach, enabling 100 hearing-impaired adults to train in the trades they currently offer, or in any of the new classes they plan to add, such as plumbing and electricity, barber classes, car repair and computer repair. The next milestone to be reached this year, thanks in large part due to donations from the Japanese Embassy in Cairo, is to open an Audiology Clinic next to the Deaf Unit. Through the clinic, they will be able to offer low-price hearing devices to those in need and to conduct hearing tests, primarily on children, to determine the severity of loss and offer early intervention, for both the child and the family. In addition to working within the walls of the Deaf Unit, they also work diligently to educate the public on the causations of and misconceptions surrounding hearing loss. 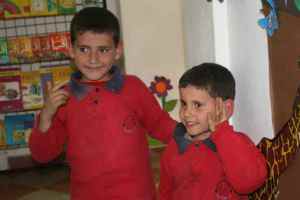 One of the primary causes for disabilities in Egypt, including deafness, is inter-marriage, so educational programs have been developed to inform communities. Through hospital and school visits, math competitions, athletic games, summer camps and Deacon Faraj’s ministry and guidance through the Deaf Church, they aim to better integrate hearing-impaired and hearing communities helping to break down the fears and misconceptions. Unknowingly, I walked in with a misconception of my own. I had assumed that a “deaf” school would be a vault of silence, broken only by the creak of doors and shuffle of feet. In actuality, you’re surrounded by the constant chatter of children’s voices, sometimes reaching pandemonium heights (and not just when Nada sees a camera). However, learning that many of these children, who Clair identifies with the help of other NGOs and doctors throughout Egypt, arrive at the Deaf Unit having no language skills at all makes the din all the more delightful. As I walk through the grounds of the Deaf Unit, past the VTC with its sawdust and buzzing saws, through the kitchen where today’s hot lunch is being prepared, past the bedrooms stacked with bunk beds, and along the decorated classroom halls filled with eager voices, I am in awe of what has been accomplished with one woman’s dream. It’s not just the physicality of the space and actuality of the classrooms, but after seeing these children and interacting with them, it’s clear that Clair, Deacon Faraj and the staff are succeeding beyond measure in raising self-confident, independent, proud and truly delightful children, who just happen to also be hearing-impaired. If you would like to get any additional information about the Deaf Unit or see how you could help, contact them at www.deafunit.org or deafunit@gmail.com.